Brisbane Duo 735 – This magnetic duo’s attention to detail in sound production with tastefully selected repertoire of various genres from the 60s to current hits, and compelling energetic performances never fails to impress. Their charismatic, infectious stage presence and visual appeal leaves audience wanting more. Brisbane Duo 735 have the vocal prowess and musicianship to consistently make every performance an event not to be missed. The show can be tailored to suit any occasion (can perform ‘acoustic only’ for intimate settings or alternatively, with backing tracks that have been customised for high energy ‘dance floor’ shows). With friendly, easygoing personalities, they maintain the highest professional standards in dress, communication and conduct at all times. Suitable to all events. The combined experience and talent of them both joined to produce nothing but the best in live entertainment as Brisbane Duo 735. 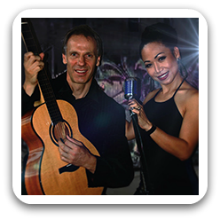 Can perform as a: Duo and are available to perform in Brisbane, Gold Coast, Sunshine Coast and Surrounding Areas. Big thank you for making are wedding night such an entertaining night. You were very helpful and played all the right music to keep the dance floor full. It was our pleasure. Congratulations once again and thank you for having us, we had an amazing time. All the best!